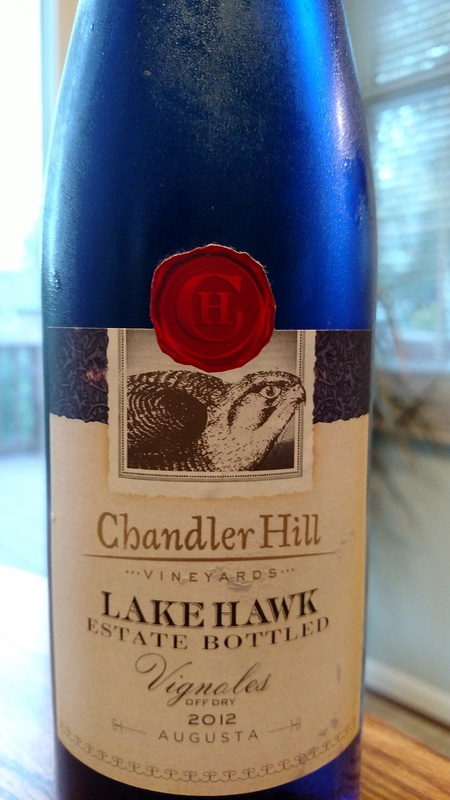 Chandler Hill Vineyards “Lake Hawk” Vignoles (off dry) | Wine Splash! When I see “off dry” on a wine label, I sometimes cringe! Everyone has a different idea of how much sweetness is sweet and how dry dry actually is. Am I going to get a syrupy sweet wine or steely dry? But then, how adventurous can one be when exploring new wines? Sampling wines, just like life, is an amazing adventure so count me in! This Chandler Hill Vineyards Vignoles is from the Augusta, Missouri wine region just west of St. Louis and hits a Cardinal home run in flavor! In my glass, pale gold in color with a platinum glow. Intense aroma’s of passion fruit, citrus, and dried apricot. Medium mouth-feel across the palate and very soft and velvety. Rich flavors of ripe mango, peach, and pineapple! On the second sip, more pineapple stood out with notes of kiwi and yellow plum lead to a long, smooth finish. It does have an off dry style with a hint of sweetness but more of a fruity sweetness from the fresh fruit this wine has. Fairly crisp on the finish and wonderfully refreshing! Perfect for summer sipping on the patio! I would pair this Chandler Hill Vignoles with appetizers, a fresh summer salad, lemon roasted chicken, shellfish, and mild to medium cheeses. Dry enough to satisfy your dry wine aficionados as well as the sweet tooth. Enjoy this wine now through the holidays this year. 90 Points. WineSplashing! !